In normal skin, skin cells live for about 28 days and then are shed from the outermost layer of the skin. With psoriasis, the immune system sends a faulty signal which speeds up the growth cycle of skin cells, leading them to mature in a matter of just 3 to 6 days. The pace is so rapid that the body is unable to shed the dead cells, and patches of raised red skin covered by scaly, white flakes form on the skin. People who have psoriasis are at greater risk for contracting other health problems, such as heart disease, inflammatory bowel disease and diabetes. It has also been linked to a higher incidence of cardiovascular disease, hypertension, cancer, depression, obesity and other immune-related conditions. Psoriasis triggers are specific to each person. Some common triggers include stress, injury to the skin, medication allergies, diet and weather. 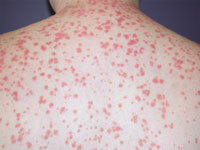 Plaque psoriasis, or psoriasis vulgaris. About 80% of all psoriasis sufferers get this form of the disease. It is typically found on the elbows, knees, scalp and lower back. It classically appears as inflamed, red lesions covered by silvery-white scales. · Scale lifters that help loosen and remove scales so that medicine can reach the lesions. · Bath solutions, like oilated oatmeal, Epsom salts or Dead Sea salts that remove scaling and relieve itching. · Occlusion, in which areas where topical treatments have been applied are covered to improve absorption and effectiveness. · Anti-itch preparations, such as calamine lotion or hydrocortisone creams. · Moisturizers designed to keep the skin lubricated, reduce redness and itchiness and promote healing. · Anthralin, used to reduce the growth of skin cells associated with plaque. · Calcipotriene, that slows cell growth, flattens lesions and removes scales. It is also used to treat psoriasis of the scalp and nails. · Calcipotriene and Betamethasone Dipropionate. In addition to slowing down cell growth, flattening lesions and removing scales, this treatment helps reduce the itch and inflammation associated with psoriasis. · Calcitriol, an active form of vitamin D3 that helps control excessive skin cell production. · Tazarotene, a topical retinoid used to slow cell growth. · Topical steroids, the most commonly prescribed medication for treating psoriasis. Topical steroids fight inflammation and reduce the swelling and redness of lesions. · Sunshine (both UVA and UVB rays) Sunshine can help alleviate the symptoms of psoriasis, but must be used with careful monitoring to ensure that no other skin damage takes place. It is advised that exposure to sunshine be in controlled, short bursts. · Excimer lasers These devices are used to target specific areas of psoriasis. The laser emits a high-intensity beam of UVB directly onto the psoriasis plaque. It generally takes between 4 and 10 treatments to see a tangible improvement. · Pulse dye lasers Similar to the excimer laser, a pulse dye laser uses a different wavelength of UVB light. In addition to treating smaller areas of psoriasis, it destroys the blood vessels that contribute to the formation of lesions. It generally takes about 4 to 6 sessions to clear up a small area with a lesion. Oral medications This includes acitretin, cyclosporine and methotrexate. Your doctor will recommend the best oral medication based on the location, type and severity of your condition. Biologics A new classification of injectable drugs, biologics are designed to suppress the immune system. These tend to be very expensive and have many side effects, so they are generally reserved for the most severe cases. · PUVA These devices are used to target specific areas of psoriasis. The laser emits a high-intensity beam of UVB directly onto the psoriasis plaque. It generally takes between 4 and 10 treatments to see a tangible improvement.